This book is the result of a truly global partnership between the Asian Studies Center, the Center for Latin American Studies, the Universidad Nacional Autónoma de México (UNAM), and the Renmin University of China. 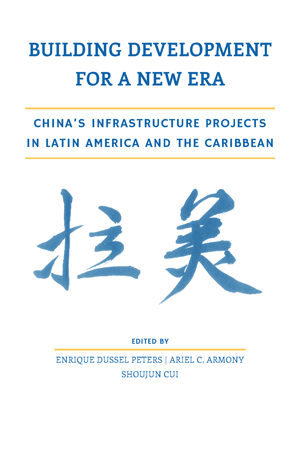 It contributes a detailed analysis of China's infrastructure projects in Latin America and the Caribbean (LAC). These projects are the latest and most ambitious phase in the increasingly complex relationship between LAC and China. Enrique Dussel Peters has been a professor at the Graduate School of Economics, Universidad Nacional Autónoma de México (UNAM) since 1993. He serves as a consultant for several Mexican and international institutions, and he earned his BA and MA in political science at the Free University of Berlin and his PhD in economics at the University of Notre Dame. Research topics that interest him include economic development, political economy, industrial organization, and trade theory; NAFTA and CAFTA; evolution of industrial, trade, and regional patterns in Latin America and Mexico. He has conducted research on specific segments of commodity chains, such as pineapples, lemons, electronics, yarn, textiles, garments, auto parts and automobiles, and pharmaceuticals, among others. All of these research interests have increasingly been pursued from a comparative perspective (Latin America and Mexico–China). As an ongoing project, he is coordinating a group of studies and respective publications of China’s overseas foreign direct investment (OFDI) in Latin America and Mexico and of Mexican firms in China. He has served as coordinator of the Area of Political Economy at the Graduate School of Economics at UNAM from 2004 to 2008, and he is currently, since 2006, coordinator of the Center for Chinese-Mexican Studies at UNAM. He also serves as the coordinator of the Academic Network of Latin American and Caribbean on China (Red ALC-China). Ariel C. Armony is vice provost for Global Affairs, director of the University Center for International Studies, and a professor at the Graduate School of Public and International Affairs and Department of Political Science, all at the University of Pittsburgh. Armony is the author of The Dubious Link: Civic Engagement and Democratization and coeditor, with Julia C. Strauss, of From the Great Wall to the New World: China and Latin America in the 21st Century. He was a fellow at the Woodrow Wilson International Center for Scholars in Washington, DC, and a Fulbright scholar at Nankai University in China. Prior to his current position, he served as the director of the University of Miami’s Center for Latin American Studies, where he held the Weeks Professorship in Latin American Studies. His research has been supported by the Rockefeller Foundation, Mellon Foundation, Kellogg Foundation, Inter-American Foundation, and the International Labor Organization. Shoujun Cui is the founder and director of the Centre for Latin American Studies at Renmin University of China (RUC), and he is an associate professor and assistant dean at the School of International Studies at RUC. He is also a research fellow at the National Academy of Development and Strategy, RUC. Dr. Cui has been an International Visitor Leadership Program (IVLP) visiting fellow to the US Department of the State and a visiting fellow of the EU Marie Curie International Research Staff Exchange project. He has presided over several national and ministerial research projects on China–Latin American relations, and he has received a grant from the Chinese government as a principal scholar. He was a coeditor of China and Latin America In Transition: Policy Dynamics, Economic Commitments, and Social Impacts, published by Palgrave Macmillan in 2016.